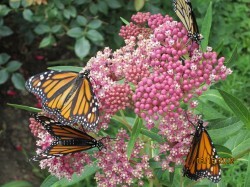 Monarchs on swamp milkweed cultivated and photographed by a master gardener in my neighborhood. Image courtesy of F.N. The Annual Monarch Migration is underway and people throughout the US are hoping for a stronger return of this regal Lepidopteran, which has reached as far as Oklahoma and Mississippi at the time of this writing. 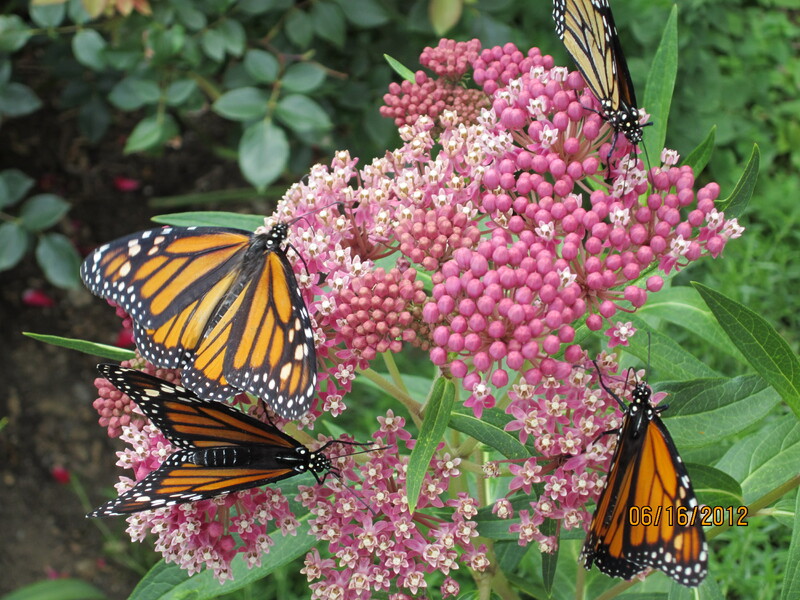 You can help by planting your stratified milkweed, or even popping some seed in the fridge for a couple weeks and getting it out there this spring for breeding monarchs to lay eggs on the growing plants. We now carry 9 species of milkweed seed balls, and often some extra seed (email me for seed). Through our Greener World Initiative, we have delivered over 1000 free milkweed seed balls to customers and newsletter subcribers throughout the continental US since Fall 2013. If you've received some from us, get 'em in the ground now!! Vending Machine- Seed Balls are NOT for Human Consumption! Bear and Matt seal the deal at Appalachian Outdoors. 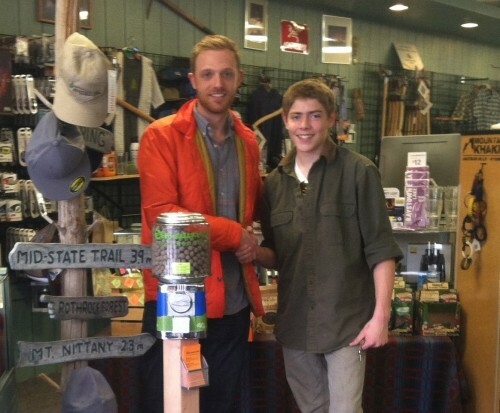 We're making our initial foray into retail with the placement of a Pennsylvania native filled seed ball vending machine in Appalachian Outdoors, here in Central PA. The first day, someone ate a seed ball. Yuck... The individual was not adversely affected (I didn't ask if they swallowed), and since, we have placed appropriate warning signs on the machine. If you're in the area, stop in. For 50¢ you can get 3-4 of the coolest clods around! Our new Shimpo pugmill. Nice uniform matrix, without the aching wrists. Although we're filling orders within 24 hours, we've been at the edge of our production capacity. We've added a clay extruder from Canadian Metalshop, TA Metalworks. This is helping us make our seed balls faster and more uniform in size. The purchase of a stainless steel Shimpo pug mill was sponsored by two passionate environmental advocates and strong Seed-Ball.com supporters. The pug mill will help us keep up with our popular seed ball kit and matrix orders without further aggravating my wrists. With entries from Hawaii to Pakistan, our Earth Day Flash Fiction contest results will be announced on April 22. Our youngest entrant was a 9-year old from India, and we had our share of senior participants from three continents. International participation was not something that I anticipated, and I am thrilled that our Earth Day Contest had such a reach. Kids on a walk. Appalachian Spring, 2012 on Tussey Mountain near Pine Grove Mills, PA.
Dr. Eric Grimm at work in the field. Taking pollen cores from sediments can be dirty business. Usually, when people think of pollen, sneezing comes to mind. But there's an entire branch of science that studies pollen - not from the perspective of allergies, but from the stand point of natural history: Palynology. 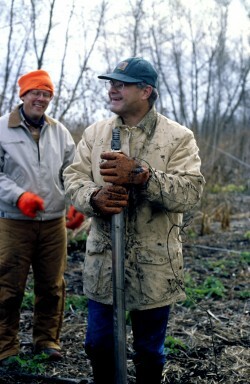 Dr. Eric Grimm is the Director of Sciences at the Illinois State Museum. He's a palynologist who investigates changes in plant communities and climate in North America through the study of pollen. 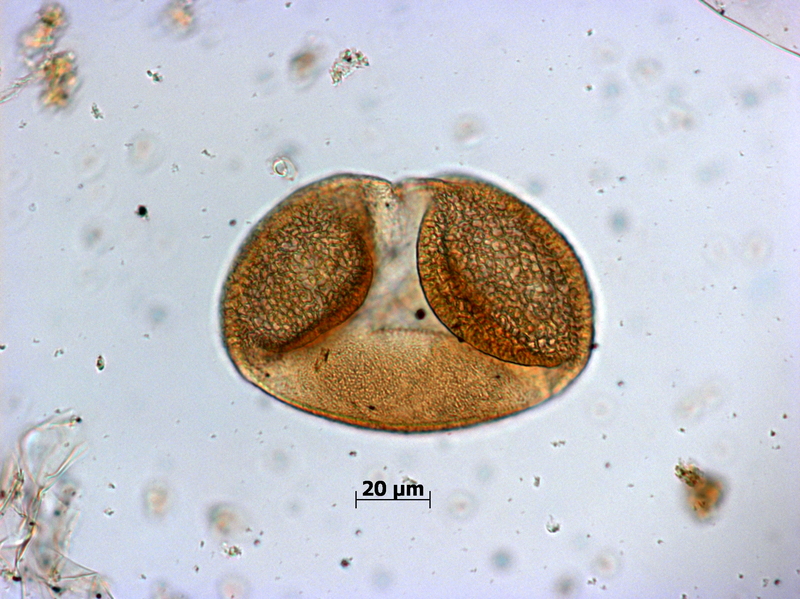 A grain of spruce (Picea) pollen. The 20μm scale bar is about 1/50 mm. How are ancient pollen preserved? Eric: Most pollen grains consist of just two cells, a vegetative cell and a generative cell When the pollen grain lands on the stigma of an appropriate flower, the vegetative cell germinates to grow a pollen tube down to the ovary of the flower. The generative cell splits into two sperm cells, which swim down the pollen tube and fertilize the ovary. The environmental challenge to these two very small cells is desiccation. To keep from drying out, pollen has evolved a very tough outer shell composed of a material called sporopollenin. The chemical structure of sporopollenin is so complex that it is not exactly known. In any case, it is very resistant to degradation and will preserve indefinitely in the right sedimentary environment, especially a reducing environment (without oxygen). Lake and marine sediments are typically anoxic only a few millimeters into the sediment, and are ideal environments for preservation of pollen grains. Pollen will preserve for millions of years. I've seen pollen from the Cretaceous period, some 70 million years ago, that looks like it came off the plant yesterday. These Cretaceous sediments have been compressed into the rock shale, but fossil pollen grains are still composed of the original sporopollenin, which indicates how stable this material is. How far back in time does the pollen record go in North America? Where are the oldest fossil pollen in north America? 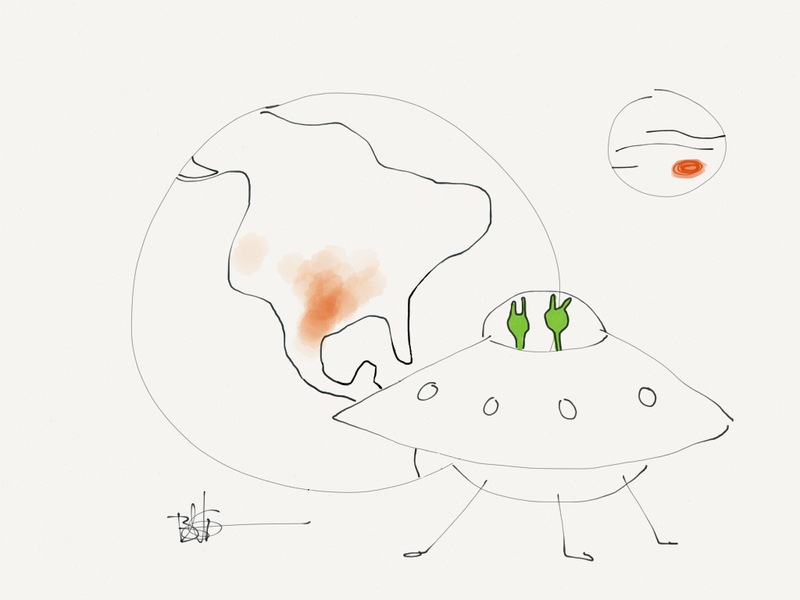 Eric: Spores first appeared the Silurian, some 440 million years ago. Pollen may have first appeared in the Devonian, but for sure by about 340 million years ago the early Mississippian. Fossil spores and pollen are as old as plants. Coal deposits are treasure troves of ancient pollen. 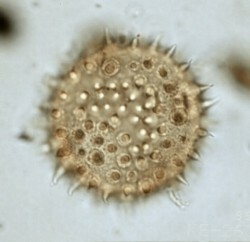 A sediment core containing ancient pollen grains. In the Central US Prairie states, what past vegetative changes have you inferred through your research? Eric: In recent years I have focused on two main issues. The first concerns the timing and nature of vegetation changes following the retreat of the glaciers from the last ice age. The timing question is especially as to whether changes are synchronous over large regions and in particular synchronous with changes seen in the North Atlantic region. The vegetation of this time is said to have "no analog," which means that although the major species still exist, the combination of these species resembles nothing on the landscape anywhere today. These unusual vegetation types were a response to climatic conditions that were also unlike any today. With global warming, climate is likely headed in a direction that will be unlike any that has existed for millions of years, and how ecosystems respond to different climatic conditions is of relevance. My second interest has been reconstructing very high resolution, decadal scale, records of vegetation and climate change for the past 10,000 years. We don't have a very good handle on decade to century scale climatic cycles, and understanding these is important for untangling anthropogenic global warming from natural cyclic variations. What impacts might predicted climate changes have on the prairies? Eric: That depends on where. The current trends are for drier climate in the southern Great Plains, but wetter climate in the northern Great Plains. What's the most interesting aspect of pollen that we might not know? A grain of globe mallow (Spaeralcea) pollen displays striking symmetry and some serious spines. Eric: Evolutionarily, pollen is very conservative. Modern molecular genetics, or phylogenetics, is revolutionizing plant classification, because reconstruction of the genetic makeup of plants reveals how plants are truly related. When I've seen some new classifications, I've said "I could have told you so!" For example, the tree hackberry has traditionally been placed in the elm family. It's at tree and looks superficially like an elm. However, molecular genetic studies show that hackberry really belongs in the hemp family and is related to hemp, or marijuana, and hops, which is used for beer brewing. Indeed, hackberry has pollen that looks nothing like elm, but does look like hemp and hops! Purple prairie clover is a US native perennial that is found throughout the central US. Although it is not a true clover, it is a legume and fixes nitrogen through association with Rhizobium bacteria, (which happen to be our Soil Life of the Month). Purple prairie clover can reach almost a meter tall, and can be quite bushy, sporting abundant clusters of cylindrical purple flowers. It blooms throughout the summer in the Central Great Plains, and in the mid-late summer farther north. Apparently, it is a nutritious and tasty plant for grazing cattle. 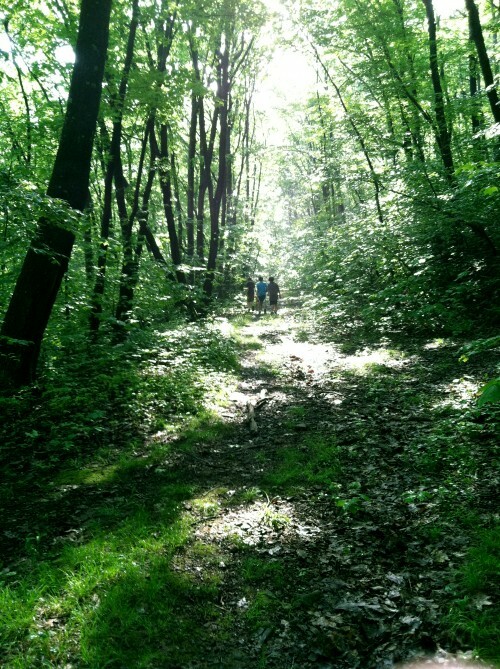 It is also used for slope stabilization, road beautification, and ground cover throughout much of its native range. Native Americans made good use of the plant. Parts of the plant were used as teas, flavorful roots were chewed, and extracts from leaves were used to treat wounds. 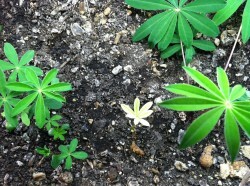 It likes sunny positions in well-draining soil. The seeds do not require stratification, so plant now and enjoy! Unlucky lupine... 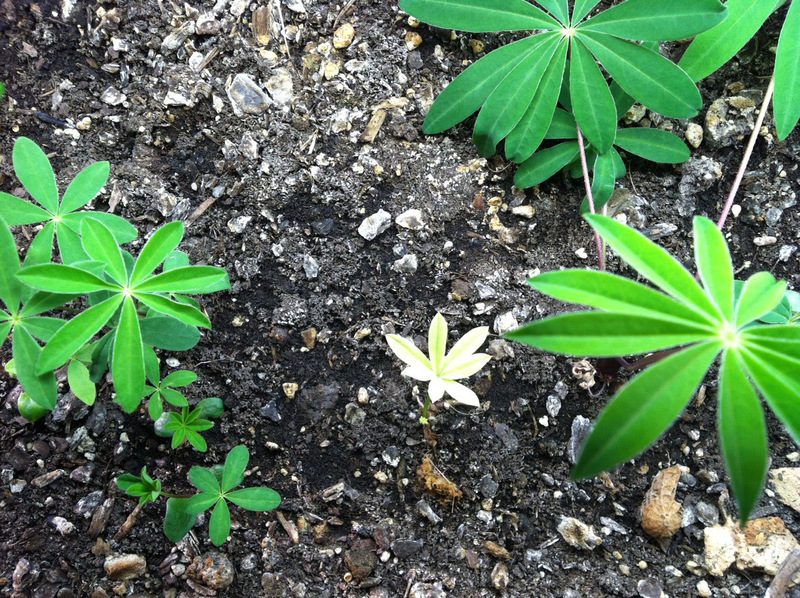 The pale lupin in the center failed to associate with Rhizobium in some nitrogen-limited soil. Plants need nitrogen, and have to get it from the soil. Unfortunately, many soils don’t have a lot of nitrogen available for plants, and that can limit their growth. But many legumes evolved a symbiosis with a certain genus of bacteria, Rhizobium. The relationship between legumes and Rhizobia is quite intimate, and benefits both partners. Rhizobium cells can live in the soil without plants, but without the plants, they do not fix any nitrogen, they lack the necessary enzyme, nitrogenase. When a legume seed germinates, if it is fortunate, its roots will come in direct contact with cells of the right species of Rhizobium. When this is the case, receptors on the root cell walls detect certain chemicals released by the Rhizobium and form a thread-like tunnel into the cell, through which the bacteria travel. 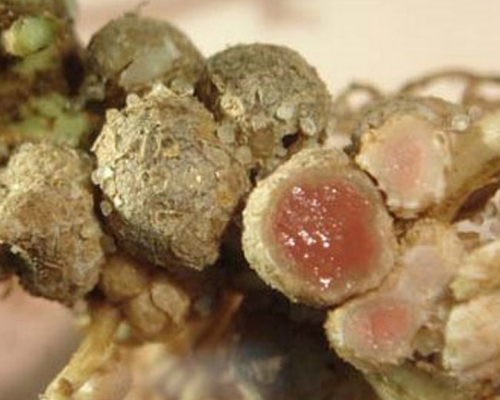 Once inside the plant’s root, the bacterial cells rapidly reproduce rapidly forming distinctive nodules on the plant’s root system, and can now gain use of the plant’s provision of nitrogenase. Oxygenated leghemoglobin gives a freshly cut Rhizobium nodule on a legume root a fleshy appearance. Nitrogen fixation is extremely sensitive to oxygen levels within the root of the plant. The plant further facilitates nitrogen fixation by providing a protein remarkably like our own hemoglobin, called leghemoglobin. Iron in leghemoglobin absorbs excess oxygen- similar to what happens in our lungs, providing the ideal oxygen concentration for the sensitive reaction. The oxidized iron in leghemoglobin gives these nodules an eerily fleshy appearance. For the plant, atmospheric nitrogen is turned into readily available ammonia, right in the plant root! That’s a cake walk- in a nitrogen-limited system, a plant would otherwise have to invest in a significant root system without Rhizobium. For the bacteria, the plant provides a steady stream of food sources. If only people could get along so well! Code available in the e-mail edition. This passcode entitles you this month's exclusive promotion: 3 Purple Prairie Clover seed balls FREE with purchase. 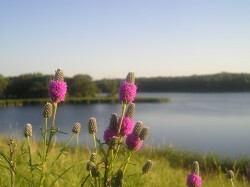 Add 3 Purple Prairie Clover seed balls to your cart, and type the code at checkout to access your discount. Forward this to a friend, and they can get the freebie, too!